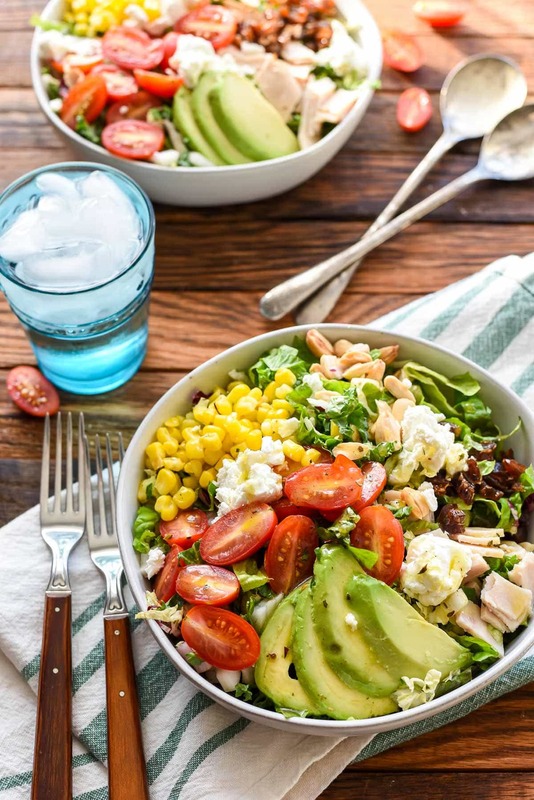 If you’re looking to up your salad game this year, try this Copycat Northstar Chopped Salad loaded with goat cheese, dates, and avocado. Plus, learn a few tricks to make restaurant quality salads at home! I just realized I’ve kicked off the last three Januarys with a salad post. Am I predictable or what? First, there was this Massaged Kale Salad with Avocado and Goat Cheese (eye roll at kale for being high maintenance, but this salad is LEGIT). Then there was That Good Salad (obviously named because it’s that good! ), and now I bring you this Copy Cat Northstar Chopped Salad. I’m a little amused by myself, to be honest. I’ve never been one to make major food-related New Year’s resolutions. I prefer to make small, manageable changes and adjustments throughout the year…changes that don’t feel overwhelming and still allow me to eat chocolate chunk cookies, of course. Still, I suppose all of us feel the need to shove some greens into our face after two months packed with big food holidays. If I’m craving a salad here in Columbus, Northstar Cafe is always my top pick. Their salads are piled high on giant platters and served alongside hunks of homemade bread that smell like rosemary. Nothing about their salads says denial. They’re super flavorful, fresh, and filling. I always think salads taste better in restaurants, which is frustrating when you’re trying to save some greens by eating more greens at home (heh. See what I did there?). 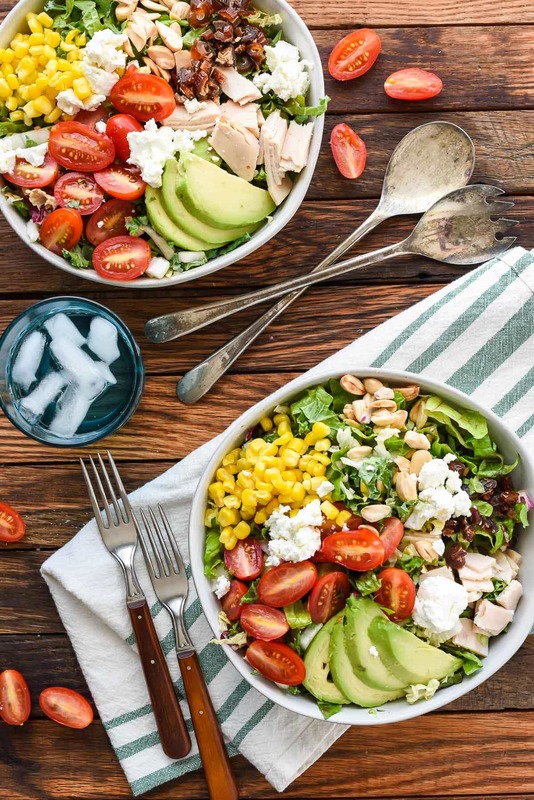 Luckily, in my quest to recreate my favorite Northstar salad, I also discovered a couple tricks that can help you make great salads in your own kitchen. First, use a variety of greens. No wonder my salads at home taste so boring. They’re typically made with just spring mix or just romaine. The thing I like most about my favorite restaurant salads is the variety of textures, tastes, and colors. All of that starts with using a variety of greens. For this particular salad, I went all out and used romaine, napa cabbage, raddichio, and just a little bit of kale. I realize it can be a pain to keep all of these greens on hand, so feel free to just pick 2 or 3 OR look for bags of prepared greens that have a variety. Secondly, cut your greens (and other ingredients) into small pieces. The beauty of the chopped salad is in the CHOP. The chop makes it easier to eat and makes it possible for you to get a little taste of each ingredient in every bite. Third, season your greens and your toppings. Salt and pepper does a world of good for greens and any fresh vegetable toppings, like the tomatoes, corn, and avocado. Alright, now we get to the good stuff. Great restaurant salads have fresh, interesting toppings! The toppings for this salad read like a book that takes an unexpected plot twist at the very end. We start with chicken, cherry tomatoes, avocado, and corn. At this point, you’re probably thinking taco salad, right? But waaaait, we’re also adding almonds, goat cheese, and dates. You read that right. Try not to think about how weird it all sounds and JUST DO IT. You won’t regret one bite of this crazy combo. Do it up Northstar style with big dollops of goat cheese (somehow far more luxurious than tiny crumbles), and you’ll be in salad heaven. Leftover rotisserie chicken is great for this, but chopped deli chicken or turkey (which is actually pictured) works just as well and is so easy! Alright, two more secret restaurant tricks to finish you off. First, homemade dressing. This one is super simple–just some oil, white wine vinegar, dijon, honey, and seasoning. It comes together in minutes and makes all the difference in the flavor. Finally, you’ll want to toss the salad before it goes on your plate, so basically do exactly the opposite of what you see in the picture. 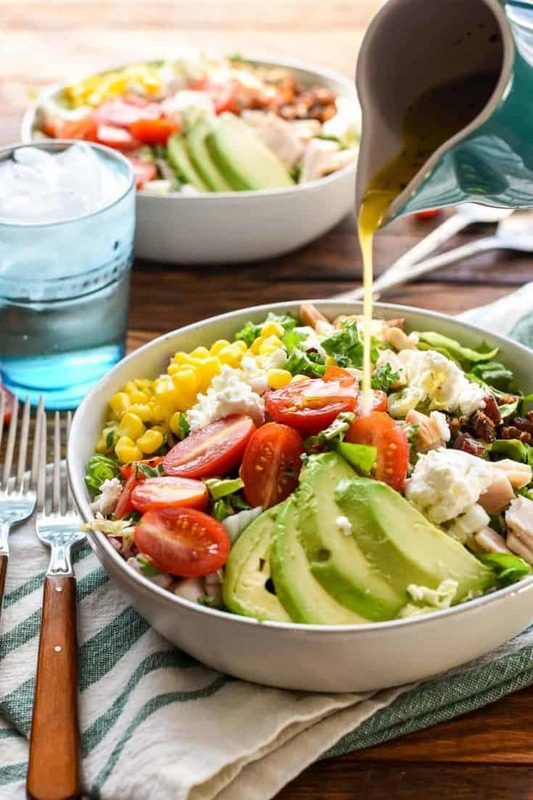 #badfoodblogger Put the dressing at the bottom of a big bowl (or a smaller one if you’re just serving yourself–adjust the dressing accordingly too), then top with the greens and use tongs or your fingers to gently toss everything together so the leaves are evenly coated. Season with more salt and pepper as needed then find yourself a big bowl and dig in! This salad packed with dates, goat cheese, avocado, and crips veggies is always a huge hit! To make the dressing, whisk together all the ingredients until smooth and no longer separated. 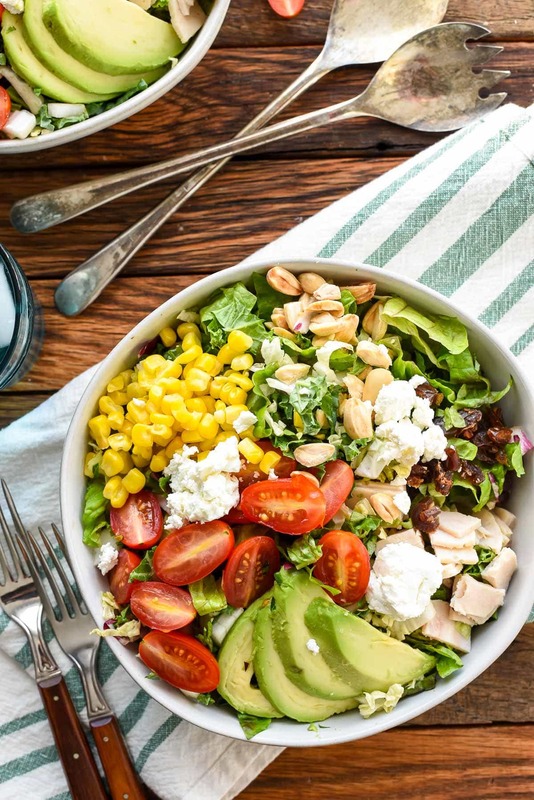 Divide the dressing evenly between four salad bowls, then add the greens and toppings. Gently toss with tongs or your fingers until everything is evenly coated. Serve immediately. I recommend using a variety of greens for the base of this salad. I usually use 2 cups romaine, 2 cups napa cabbage, 2 cups kale, and 2 cups radicchio. Feel free to sub out your favorite greens, but I do recommend using at least two different types. 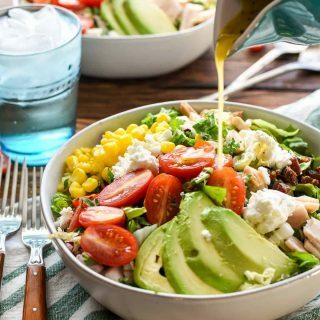 That salad is seriously one of my favorites in town and in an effort to save money started making it at home as well and make it all the time!